As time and technology march on, guitarists either resist or embrace change, much like every other segment of the population. In a half a century, we have gone from simple hand wired circuits to PCB boards controlling a host of functions on multi-channel amps, capable of interfacing with other gear to create sounds and textures previously unobtainable. If you like your fifty years old amp and a good drive pedal in front of it (we do too), this amp is probably not the one for you. Now that grandpa has left the room, it’s time to talk shop with the cool kids! Peavey is back with a flagship amp, the Invective.120. A multi-channel fire breather, this amp is marketed to the metal community thirsty for great sounding, high-gain sounds and modern, real-world usability. Released at a highly competitive price point, this amp will keep Peavey relevant in high gain amplification for years to come, and if it’s got the tone you seek, it definitely won’t leave you wanting for any advanced features. 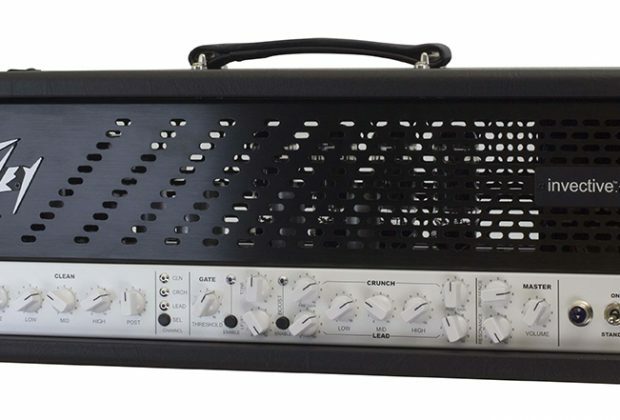 The Peavey invective.120 is a three-channel, 120-watt, high-gain, guitar tube amplifier. 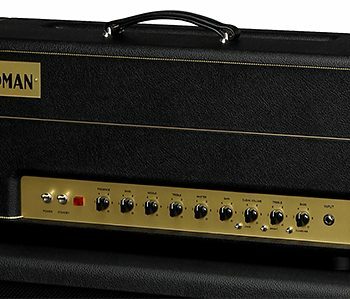 The head is driven by six 12AX7A/ECC83 preamp tubes and four JJ 6L6GC power tubes; fortunately, a Half Power toggle switch on the rear panel tames this wild beast and enables better control over the massive amount of volume this amp is capable of delivering. The clean channel offers five EQ controls (Pre, which adjusts sensitivity; Low, Mid, High; and Post, which adjusts volume) as well as a button- or footswitch-activated preamp boost circuit with adjustable Tone and Drive knobs. The Crunch and Lead channels share three EQ controls (Low, Mid, High) but each has independent Pre-Gain and Post-Gain knob controls for dialing in your sound. These channels also share an adjustable noise gate and a dedicated preamp boost circuit that is independent of the clean channel’s boost. The master section contains controls for Presence, Resonance, and Master Volume. It should also be noted that the front panel has push buttons that enable you to toggle between the channels and to engage/disengage the boost circuits and noise gate, handy for when you’re sitting or standing in front of your amp trying to dial in settings on the fly. In addition to parallel speaker outputs with a 4/18/16 ohm selector switch, the rear panel features a “Microphone Simulated Direct Interface” XLR out with adjustable tone and level knobs, and master boost level control. There are two independent series effects loops, as well as two auxiliary 9V DC 500mA power supply outputs, a very unique and welcome feature for use with a few of your pedals. 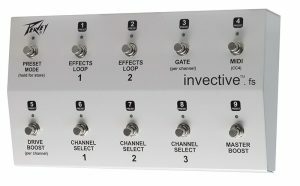 The amp is fully controllable over MIDI, and it includes a versatile footswitch (called invective.fs) that connects to the amp using standard MIDI DIN-5 or DIN-8 cables. The included DIN-8 cable provides phantom power to the invective.fs or other MIDI foot controllers that support this popular power method. 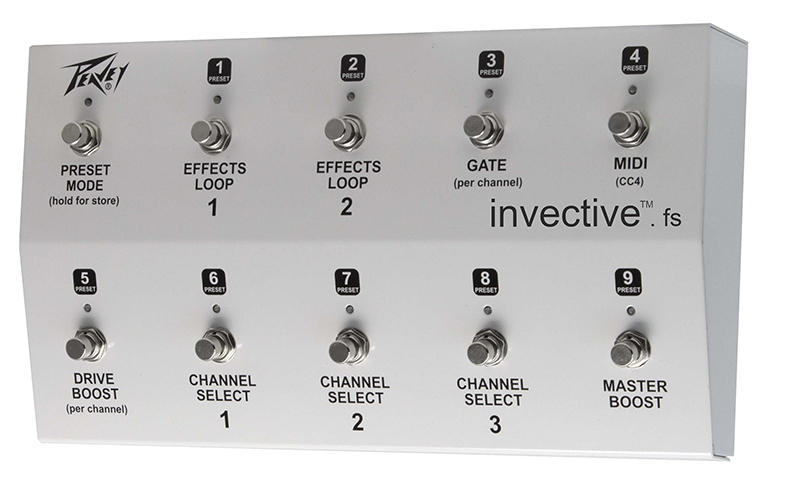 Looking at the footswitch itself, the invective.fs features ten footswitches that enable users to access each effects loop independently, toggle between the three different channels, activate boost controls, and select one of nine customizable presets. Because the amp responds to standard MIDI CC messages, you can easily substitute other MIDI foot controllers that you may already use to control your guitar rig. Given the complexity of this amp, specifically having pre and post gain controls on each channel, dialing in tones we were happy with took some time to do. With such a full-featured, multi-channel amp, there tends to be a learning curve and the invective.120 is no exception. Balancing out the amp’s channels wasn’t too difficult. What does take more careful consideration is all of the other stuff. The boost level knob is located on the back of the amp. This is not a game ender, though, and for most playing situations this control is just a set-and-forget affair. It does allow for a large amount of clean volume boost, so be careful before stepping on that switch the first time. The noise gate also needs to be carefully considered, as its single knob, if adjusted extremely, will cut off your quiet passages when engaged. The Drive Boost is the single most important feature on this amp to balance—because you have two of them (one for the clean channel and one for the dirty channels). It can be activated across all three channels, and the amp remembers whether you left it engaged or not, so when you switch back to the channel in question, the boost will default to the previously engaged (or not) state. Happily, this feature means one less stomp box needed and really speaks to the amp’s functionality. The amp works in conjunction with the footswitch to write and recall presets. Using the amp in this way, reading the manual is of the upmost importance! We were able to write and store several presets, but we could also double-tap the preset to engage the amps boost. This is much faster and more economical than leaving preset mode to engage the boost feature, and we learned this only after reading the manual. 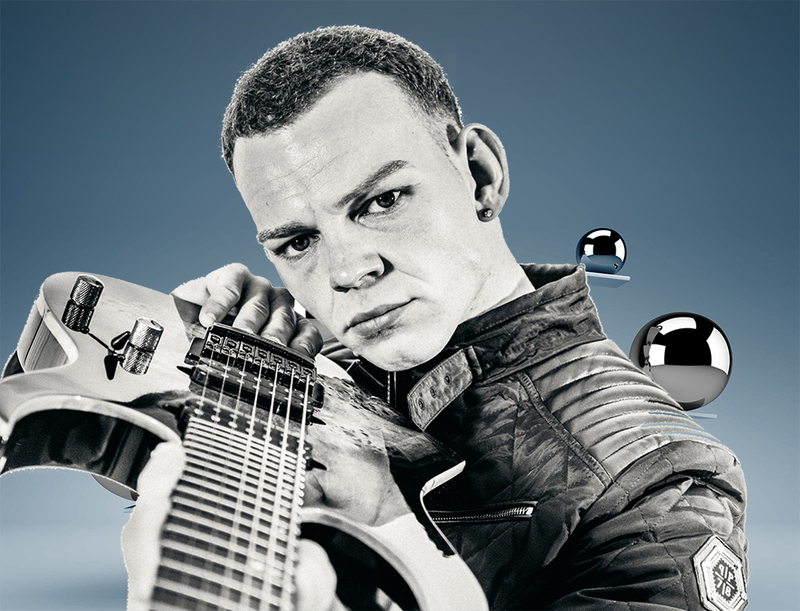 A MIDIot (noun: a guitarist ignorant of MIDI equipment. See: Bass Player) would have problems connecting and programming this amp for use with external MIDI gear, but we had no problem controlling the amp from a TC Electronic G-System. The footswitch is designed to give you nearly complete control over not only the amp, but external MIDI gear as well. This takes time to program, but those of you who love MIDI gear will welcome such a fully featured amp. 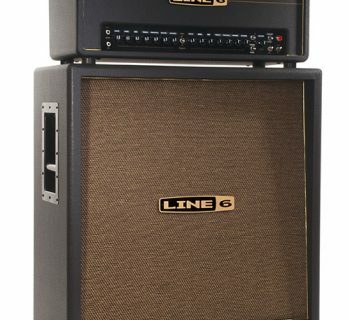 We mated the Peavey invective.120 to our Friedman 4x12 V30/Greenback-loaded cab as well as an ENGL Pro 2x12 with V30s. The clean channel sounds fantastic, and for an amp marketed to metal players, this was a great surprise. Many high-gain amps give you a clean channel, but it’s more for utility and less for being an actual selling point. The clean channel had good spank and snap to it, and begged for some funk-infused rhythm lines. We found the Low, Mid and High knobs on this channel to have a wide sweep to them, allowing for some pretty radical tonal options. The shining star, and our favorite configuration of this amp was the boost feature on the clean channel. Playing our Knaggs Choptank single-coil guitar, we were able to get some pretty spankin’ SRV type overdrive tones with these settings dialed in. This is probably where Classic rock tones end in this amp. Grabbing our Jackson RR1 Flying V, we played this Seymour Duncan equipped guitar through the Crunch channel. Some 6L6 amps are voiced in a way to give you good, classic rock crunch, putting them in the realm of their EL34 counterparts. However, this is not the case with the invective.120. Its tones were darker than what you’d want for your typical bar rock band. This amp is marketed as a metal amp, and rightfully so. Dialing in a healthy amount of pre gain, the amp had a lot of good, solid crunch, although with the mids boosted to 10, this amp sounded like it was on a scooped mids setting. Dialing back some pre gain helped, but didn’t eliminate this entirely. The tapers on the low and high knobs never became too extreme to sound bad. They were voiced thoughtfully. Sharing the crunch channel’s equalization section is the lead channel. The lead channel had an ungodly amount of gain, but is respectably quiet, even without a noise gate. Note that noise reduction is not the intended purpose of this gate, but given the djent stylings of this amp’s design collaborator, Misha Mansoor of Periphery, the noise gate in the invective amp serves to make syncopated rhythm lines tight. As much gain as this amp has, its quite well mannered. The lead channel had that same scooped out sound to it, and genre and player depending, this is either a curse or a blessing. Bringing up the resonance and peppering the presence control was beneficial on this channel specifically. We were able to dial in the sound we were after to push just enough air to give us thump without mud. Despite the generous feature set, the variety of tones from the invective.120 are somewhat limited. It does clean tones remarkably well (and serves as quite a monstrous pedal platform), and it does high-gain rather well, too, with a voicing in the ballpark of amps like the 5150 or the EVH head. But similar to some other high-gain amps we’ve reviewed, there’s not a great amount of variety to the tones we could get from the high-gain channel. If you like the sound, though, this amp won’t disappoint. 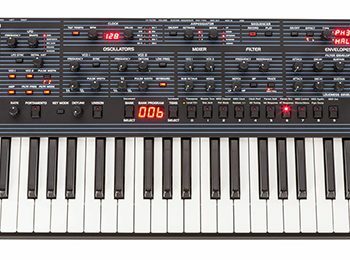 A comprehensive manual details all you need to know about this feature-packed amp, including MIDI mapping and the dizzying array of features. Toll free numbers and email are provided for customer support. A two-year warranty is provided, which is a bit better than industry standards, and tubes are warranted for 90 days. The invective.120 head (MSRP $2,499.99) sells for approximately $1,900. This is a very good price for a pro-level, multi-channel amp with an extremely powerful feature set and a great voice of its own.